Set in the 70s, a fair run by travellers is touring the UK this Spring. Owner Levi (David Essex) is trying to keep the rundown fair in business whilst dealing with his wife's death, his son Jack is searching for love, traveller Mary is just not good enough for him and her mother Rosa is still hung up on Levi. The set caught my attention instantly. From the authentic-looking battered funfair stalls, a rusty sign hanging in the background to the working dodgems, the set captured the essence of the fairground perfectly. Framed around Essex's music and focusing on Jack meeting and falling in love with Alice, the daughter of a local thug, the storyline was strong enough although their relationship developed too quickly for me. For most of the audience, David Essex was the highlight of the show. Although I cannot claim to have seen him in his heyday, to me he sounded like the echo of a man who used to be very talented but who's voice had not aged well, but his fans did not seem to be bothered by this and he was greeted by cheers and applause. As far as the rest of the cast were concerned Tim Newman stole the show for me as Jonny, a young lad Levi had taken in. His acting and vocals were both very strong and the endearing character he created was loved by all. Louise English stood out as Rosa, as did Susan Hallam-Wright as Mary but other than that I was underwhelmed. Rob Compton and Tanya Robb led the show as the young lovers Jack and Alice, but neither of them shone. Compton's vocals were a bit too weak and neither seemed to have a particular chemistry with each other, leaving their relationship a bit bland. Whilst the ensemble provided some nice harmonies, their dancing was often unfortunately out of time, although the choreography did not give them much to work with. 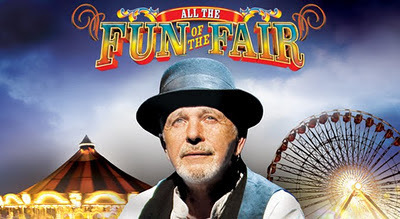 The show, whilst not outstanding and building to a climax that never really delivered, held itself together well and the audience seemed delighted with David Essex's presence and performance. All the Fun of the Fair is at Fairfield Halls until Saturday 17th March.